Before finding YLF I didn’t know that shoes possess magical powers. Sure, my heart would beat a little faster over all the eye candy in the shoe shops, but that didn’t stop me from making rather uninspired choices. I just never realized how big of an impact the right shoe can have. How a pair of two-toned oxfords creates a completely different mood than a wedge sandal with a cork heel. How the perfect ped simply transforms any outfit. Angie and the many shoe mavens on the forum finally helped me put two and two together. Today I’m still far from an expert, but experimenting is proving to be heaps of fun. 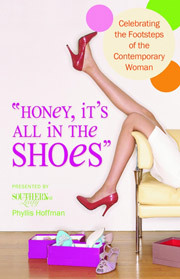 In this week’s book Phyllis Hoffman talks about the shoes she wore during various defining moments in her life. From the shoes she wore the first day of school to the ones she sported the day her twin sons were born, footwear fan Phyllis Hoffman remembers them all. In “Honey, It’s All in the Shoes: Celebrating the Footsteps of the Contemporary Woman” she reminisces about her favourite pairs and the small and big steps she took in them. Defining moments in her own life are mixed with stories of style icons and the shoes they loved to wear. The book also contains celebrity shoe quotations and black and white illustrations of footwear throughout the ages. White leather ballet flats — My first pair of “grown-up” shoes. They had an almond toe, a basket weave pattern and made me feel like Audrey Hepburn. I walked a little taller in those cuties and wore them until they literally fell apart. Dr. Martens 20 eyelet boots — Purchased during my first year on YLF. The gunmetal silver was a limited edition and I’m heartbroken that they no longer fit. The punk rocker in me loves how they add a little edge and lots of attitude. Plus there’s nothing like a pair of sturdy soled Docs to stomp through the Belgian snow. Fly London yellow wedge sandals — These have led to another YLF-inspired epiphany: I discovered that yellow footwear can act as a neutral. To my surprise these sandals work with practically every item in my closet, and catching a glimpse of my “bold” yellow shoes always makes me smile. Do you have any “big impact” shoes or a pair of peds that has special meaning for you? Friday 25 May is kick-off day for our next Book Club title. We’ll be chatting about the movie version of The Devil Wears Prada, with Meryl Streep and Anne Hathaway in the leading roles. 1) a pair of navy kidskin hush puppies ballet flats with a low mary jane strap and a rubber waffle sole from age 8 or 9— I remember fighting with my mother about them because I wanted heeled shoes since that is what all the other girls wore. She won, and those are the most comfortable shoes I’ve ever owned— and the only ballet flats that have ever worked for me. I’d kill to have another pair. 2) converse— I think I was 14 or 15 the year I bought my first pair. This was after they had been popular in the 80s and 90s (and obviously before that) and before they were popularized with teens again— me and the kid that did his hair with Elmers glue were the only ones that wore them, although I got a lot of compliments from kids of the 50s and 60s that used to play ball in them. Mine were red high tops– very punky and I wore them into the ground and added a military green pair and a pair with skulls the next year. They defined my style for a good 6 years. 3) Frye harness boots— I have a saddle colored pair I got when I was 16 or 17 found for an incredible bargain (like 150 bucks)– I knew the quality and the style was right up my alley. Boots became my thing, and they still are very integral to my look and I love the way they feel. I’m now looking for my next style-defining shoes. 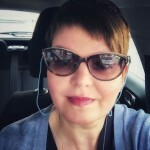 Inge– do you mind me asking why your Docs no longer fit? Just wondering because I have a whole bunch of shoes I can’t wear (or have had to get rid of) because of a foot injury that caused my feet to slowly shrink a couple of sizes over a few years– during that time I bought lots of shoes so I’d have something to wear. Then I got my feet worked on a bit and the problem mostly corrected and now my feet have returned to their original size! None of my shoes except those bought in the last 2-3 years fit, so all my beloved boots need replacing. Ah, shoes! I remember my first pair of “high heels”–I was 11, they were perhaps an inch and a half high, black leather Mary Jane style. I felt very sophisticated. Can’t wait to wear them to work this Monday. Oh so much! My Fluevogs! I was madly in love with Fluevogs when I was a teen/early 20s, but it took me until now, 20 years later, to let myself buy them! They were too hip, too cool, too wonderful for me. Or at least that’s what some tiny little voice in the back of my head kept saying. Now I have them and it’s all love all the time. I’m trying to build a more interesting shoe collection by adding some “big impact” shoes since I only recently learned how footwear could make or break an outfit. Shoe shopping is so much harder for me than shopping for clothes. – My first pair of proper grown-up shoes bought for college, with money I’d earned over the summer working at the petrol pump. Very expensive, ridiculously so at the time according to well-meaning relations and even some friends, and supposedly most impractical for a tropical monsoonal climate. They were light grey/tan suede pumps from Marie Claire (Bata fashion brand), with a fine brown trim — the only pumps I’d ever seen with a notched back edge, meaning I didn’t get the usual blister where ankle meets heel. I wore them with everything from jeans to skirt suits (mock presentations in ‘boardroom’ classes), and literally wore them every other day for a couple of years of summers and winters (bar the rainy season) — until I wore them into the ground. No regrets! – 3-inch stack-heeled lace-up ankle-high sandals in soft brown leather. ‘Consolation’ present from Dad when I ‘wasted’ a year of college to switch streams, then a year later decided to switch back with the prospect of another 2 years ‘lost’ if I had to enroll as a freshman again. (Didn’t have to, lost one year, yes, but the university I’d gone back to was kind enough to enroll me as a sophomore). Definitely a special occasion shoe, but they were a reminder to have fun and heartwarming for this reason. – Turquoise and lime Hush Puppies sneakers picked up on a lark, on discount, sometime in my late 20s, at my then-boyfriend’s urging. I’d always found the brand unaffordable before, and had never had sports/sporty shoes except my school sneakers. The comfort was such a revelation, I went and took a chance on Hush Pups at full price (wearing current pair of 3-year-old suede wedges into the ground now) — and married the man. Interestingly, all of these seem to have stories attached, so the significance is aesthetic plus emotional. Reading through your shoe moments was so fun! Thanks for the fab post, Inge. How true that some of ped-darlings hold an extra special place in our hearts. I really hope that you find another pair of silver 20 eyelet Docs because they were made for you! And how can a yellow pair of shoes NOT make you smile. 1. Red Kate Spade Stacked Pumps because they always look pretty and lady-like. 2. Black 20 eyelet Docs because they are iconic. 3. Cream go go boots because they give me super powers. 4. Stuart Weitzman colour blocked ballet flats because they feel like slippers. 5. Chie Mihara striped gold and cream low heeled pumps because they always cause a stir. 6. Apple green cowboy boots because they are the most perfect green in the world. 7. Prada flat slouchy taupe boots because Greg bought them for me in Milan and my feet love them. I”m afraid that the shoes I had to wear because my Dad bought them for me with practicality in mind (think thick black rubber soles) are more likely to make me want to cry than smile. YLF has convinced me of the importance of the right footwear to look modern and stylish. Right now I’m loving booties and peeptoe booties. Inge, you’ve inspired me to look for some yellow summer shoes. I’ve not yet come across any I liked on my feet. I remember a pair of cream snakeskin flats I bought for my first high school dance. I adored those shoes! Oh… this is something I really don’t need — more shoe obsession! – dark red (cherry color) 40s style wedges with a low heel (2″ or so), either a mary-jane or t-strap with a closed back, maybe peep-toe (maybe not), preferable a slight platform. I WILL wear these a lot! I remember springing for my first pair of “expensive” shoes – I believe they were Franco Sarto heeled loafers. This was over 20 years ago, so I guess my tastes have not changed much – just become much more expensive. I also remember my first pair of designer shoes, bought second hand, were Prada square toed heels that I wore perhaps 3 times. But they still lurk in the back of my closet. Elly: Until two years ago I used to wear a US size 8, somehow my feet seem to have grown since then, and I started needing an 8.5 or a 9 (making the Docs very tight in the heel area). Recently I had to size down to a size 8 again in two pairs of new shoes, yet the other 8.5’s and 9’s in my closet still fit. Not sure what is going on here. I’m so sorry to hear about your shoe woes, I too would be very sad if I had to say goodbye to all my boots. Do treat yourself to an extra fab new pair! Amanda: Lovely pumps, have fun wearing them on Monday! k can shop: I bet you rock your Fluevogs, and we all deserve shoes that make our hearts beat a little faster. Jewell: I hear you, and can I just say that I love the animal print peep-toe wedges you modelled for us in your last WIW. Manidipa: Love your Hush Puppies story. Angie: LOL about your go go boots:-) And extra yay for shoes that are beautiful AND comfy, we can never have enough of those. Joy: You have an awesome shoe collection, and I’m holding thumbs that you’ll find a fab pair of yellow peds this Summer. Meredith: Love the sound of your cream snakeskin flats. Rosee: Can I come visit your shoe closet?-) And oh boy, cherry red 40s style wedges, yes please. I was just thinking the other day how my taste in shoes has remained the same since I was 5: mary janes, t-straps, wedges, patent leather. I did add, as I got older, what I will call “flat court shoes.” I used to love these Italian ones, but sadly, I don’t see them sold any more. Not that I limit myself to these, but they are staples I love. Also, on the subject of milestone shoes and fathers… If I recall correctly, as part of the quinceanera, a girl’s father presents her with her *first* pair of heeled shoes. Anyways, in many ways I do believe my father dressed me more than my mother. He had a dress code and a sense of fashion that he inflicted on me / inspired in me, LOL. I think it was him that persuaded me to chose my first pair of nice, black pumps. I.e., grown up shoes. And also, Ferragamo flat courts with bows (fancier and more formal than my beloved Italian ones)(not that Ferragamo isn’t Italian…).